We’re thrilled to announce that Graciela Rutowski Interiors was recently featured in a Huffington Post article among other talented interior designers. The article, titled “6 Tiled Rooms That Take Things Beautifully Beyond The Backsplash” by Samantha Toscano, features beautiful bathroom design that uses tile as the room’s main attraction. Thank you for including us! The piece focuses on rooms that incorporate stunning tile backsplashes or wall patterns into the overall design, becoming the main attraction of the room’s décor. 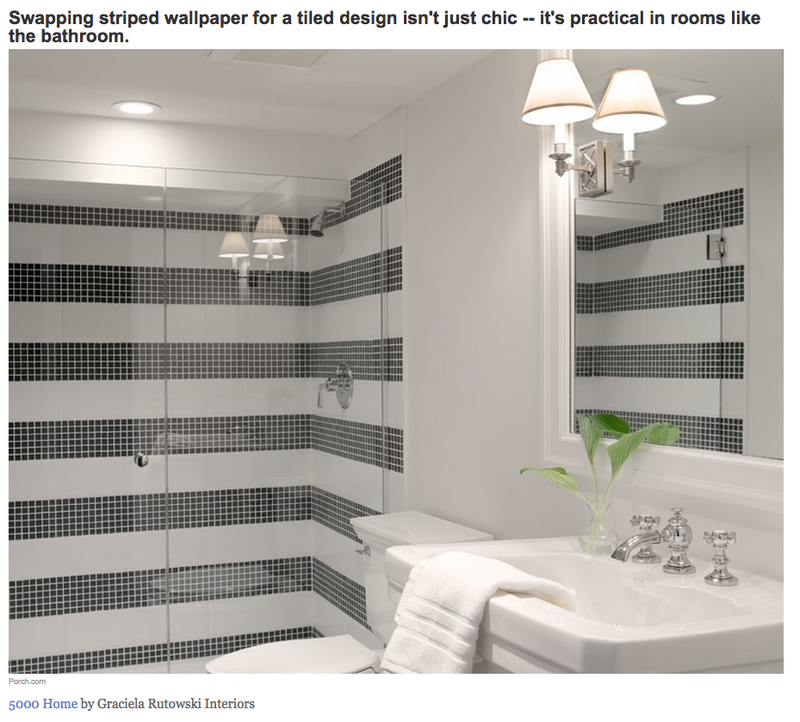 GR Interior’s bathroom design in our 5000 Home project is featured in the article. Along with the tile backsplash, this project included a traditional, minimalist, craftsman theme throughout the home. The vertical tiled pattern in the shower brings an element of depth to the room and adds texture to the clean, white space. The article describes our design’s classic look and practicality: “Swapping striped wallpaper for a tiled design isn’t just chic—it’s practical in rooms like the bathroom.” This arrangement of tile is both functional and aesthetically pleasing for the small space. It creates a simple centerpiece for the room so that excessive decorations are not necessary. Check out our bathroom decorating tips for more ideas. Make sure to check out the Huffington Post article and our 5000 Home project on Porch.com! View our complete portfolio here. Contact us at GR Interiors to begin your interior re-design… who knows, maybe your home could be the next one featured in a publication like Huffington Post! Posted on October 28, 2014 by graciela in Featured, GR Interiors, Interior Design, Press and tagged Huffington Post by graciela. Bookmark the permalink.